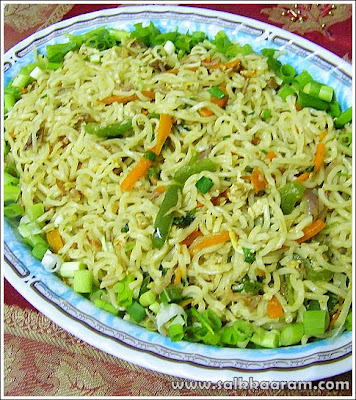 Chicken Noodles | Simple and Delicious ! Got up late? You have to awaken kids, help them do the routine, have to send them to school.. No time to make break fast and how could fill their lunch box? You get the sight of instant noodles packets placed on the kitchen shelf. Oh God, that's enough! Don't make sighs of relief often, there are lots of warnings waiting for us. Instant noodles contain wax (that prevent sticking while cooking) which causes cancer if taking frequently. And there are lots of other health issues are related because of the high amount of sodium, carbohydrates and mono-sodium glutamate (ajinomotto) in it. I should prevent my kids from prompting to make them frequently, am not sure they are going to accept my arguments..
Cook noodles and keep aside. 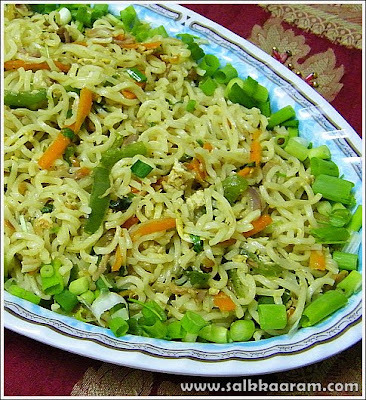 If you use packet noodles like Indomie or Maggi make it according to the packet instructions. Cook chicken with little turmeric powder, pepper powder and salt in enough water. Allow to cool, chop into thin pieces. Chop carrot into thin strips. Heat oil in a wok, add pepper corns and garlic chopped. When it turns brown add chopped onion. Saute well until transparent, add all veggies and little salt. Add chicken pieces and pepper powder. Saute well and break egg into that. Stir slowly on a medium flame until the egg is cooked and coated on veggies. Pour soy sauce, stir and mix this with previously cooked noodles. Mix well and garnish with spring onions. You may get a good reading about instant noodles from this wiki page. All the best! I think you have taken the healthier route by not adding the seasoning packet and using fresh ingredients with just the noodles. That at least should be safer. i too am concerned about the MSG. I had not known about the wax. My kids love Maggi too! I try to limit their intake.